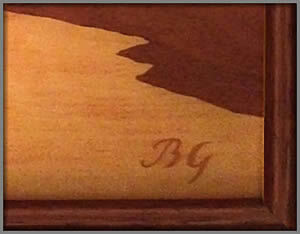 October's update brings you a Buchschmid and Gretaux wood inlay picture we have not seen before. Do check it out and see if you have an identical picture yourself from which you could let us know the titles of the piece. 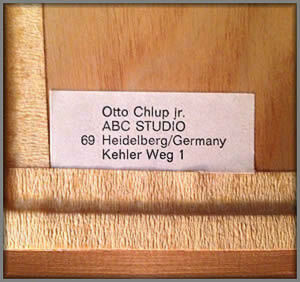 Our October update brings you a very clean looking Buchschmid and Gretaux wood inlay picture. Mike McHough owns this excellent wood inlay picture, and Mike has asked us if we can put a title to the picture and say when it was made. Well we have to say that this is one Buchshmid and Gretaux wood inlay picture we haven't seen before; this is actually a new one to us! Unfortunately without the knowledge and advice of our much missed late colleague Herr Otto Chlup, it is difficult to come up with a definitive answer to this problem. 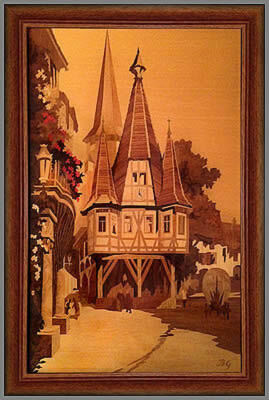 We think this could be one of the Rothenburg series. There are four titles in the Rothenburg series, these being: 1/. Rothenburg St. George’s Fountain, - 2/. Rothenburg Ploenlein Corner, - 3/. Rothenburg White Tower, - 4/. Rothenburg Marcus Tower. As we already have examples of the Rothenburg Marcus Tower and White towers displayed on this website, this leaves two we haven't seen, these being Rothenburg St. Georges Fountain and Rothenburg Ploenlein Corner. As there is not a fountain we can see in the picture, we would plump for the picture being Rothenburg Ploenlein Corner. If anyone can advise us of the actual title of this piece we would be very grateful to you for your help. We would think this picture was made in the 1950's or 1960's. Click the above button to return to page 56 of "Can You Help"